Each team is assigned a name based on the primary academic affiliation, so that's why we're known as Duke4A. The competition requires that the team have students representing different disciplines (as a real startup would) - we currently have 3 MBA students, a law school student, and a medical school student as full time team members. We were fortunate to have the support of the Duke Medical School faculty, local biotech professionals and the NC Biotech Center, to name a few, many of whom have offered their support by joining our advisory team. In particular, we've built connections with local biotech services organizations, such as local contract manufacturing organizations and clinical research organizations (CROs), such as the Duke Clinical Research Institute. As we don't yet have experience in drug development, connecting with experienced folks in the space really challenged many of our assumptions and gave us direction in our business plan. One of my assumptions when applying to the Duke MBA turned out to be true - I learned that Duke has a strong collaborative culture and vast health care resources. Everyone was very receptive to meeting us and giving us advice. As a team participating in the startup challenge, we were given learning opportunities in the form of seminars that covered topics such as negotiating licenses, obtaining seed funding, regulatory strategy with the FDA, etc. These topics were very helpful as they are not covered in typical MBA courses. Even though I had interned at the NIH Office of Technology Transfer before the MBA, gaining another perspective and learning about the topic more comprehensively helped. The timing was perfect - most of these seminars occurred during winter break, so time conflicts with classes were kept at a minimum. My most memorable experience was running around the Duke Medical Center and the Research Triangle Park (RTP) with my team rushing to our meetings. We would often run from class to meetings with key opinion leaders (KOLs) at the hospital and from one meeting to the next. We'd have meetings with biotech entrepreneurs early on Saturday morning. It was exciting to connect with so many different people over the course of 5 months. We learned so much from these meetings that it was just like a course in drug development! In the few weeks leading up to the business plan submission deadline, we spent many late nights at the Fuqua team rooms working on our strategy. Even Friday night is no exception. 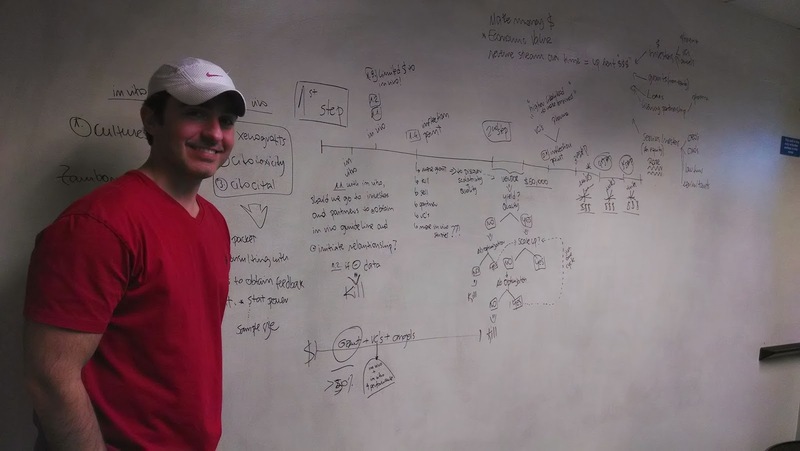 Here's a picture of my teammate Fabio Goncalves standing next to our drug development strategy on the whiteboard. These discussions were very exciting and memorable, especially when we figured out our "killer experiment" after Fuqua Friday one night. The startup challenge experience was a great opportunity to practice my leadership skills. I had taken the lead on organizing the team and getting the advisory board set up, as well as managing the communications and team meetings. It was a challenging but exceptional learning experience to motivate peers and help drive the project forward. Everyone on the team was busy with classwork and other extracurricular activities, and I'm proud of how much we've accomplished as a team in so little time. The project also gave me a great chance to apply the stuff I've learned in finance, accounting, strategy, and marketing to good use. When working on early-stage commercialization strategy in the past I had mostly focused on the science. Now with the toolbox gained through core courses in the Duke MBA and the Program 4 Entrepreneurs, I have the skills to better develop and manage the molecule's commercialization strategy. Through my team's newly formed network at Duke and the RTP we are able to get the support we need to grow this into a successful venture. Read my introduction to the Duke team here.